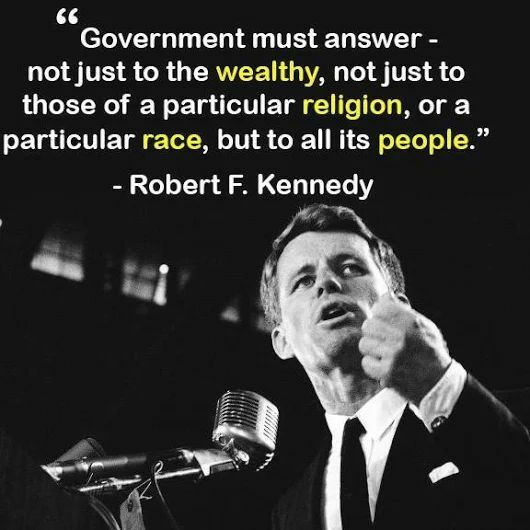 Robert F. (Bobby) Kennedy stated those words in a speech often referred to as his “Ripple of Hope” speech given to National Union of South African Students members at the University of Cape Town, South Africa, on June 6, 1966, on the University’s “Day of Reaffirmation of Academic and Human Freedom” (quote source here). The entire text of the speech is available at this link. The first element of this individual liberty is the freedom of speech: the right to express and communicate ideas, to set oneself apart from the dumb beasts of field and forest; to recall governments to their duties and obligations; above all, the right to affirm one’s membership and allegiance to the body politic-to society-to the men with whom we share our land, our heritage, and our children’s future. Hand in hand with freedom of speech goes the power to be heard, to share in the decisions of government which shape men’s lives. Everything that makes man’s life worthwhile-family, work, education, a place to rear one’s children and a place to rest one’s head -all this depends on decisions of government; all can be swept away by a government which does not heed the demands of its people. Therefore, the essential humanity of men can be protected and preserved only where government must answer-not just to the wealthy, not just to those of a particular religion, or a particular race, but to all its people. Many nations have set forth their own definitions and declarations of these principles. And there have often been wide and tragic gaps between promise and performance, ideal and reality. Yet the great ideals have constantly recalled us to our duties. And-with painful slowness-we have extended and enlarged the meaning and the practice of freedom for all our people. . . .
“Give me a place to stand,” said Archimedes, “and I will move the world.” These men moved the world, and so can we all. Few will have the greatness to bend history itself, but each of us can work to change a small portion of events, and in the total of all those acts will be written the history of this generation. Thousands of Peace Corps volunteers are making a difference in isolated villages and city slums in dozens of countries. Thousands of unknown men and women in Europe resisted the occupation of the Nazis and many died, but all added to the ultimate strength and freedom of their countries. It is from numberless diverse acts of courage and belief that human history is shaped. Each time a man stands up for an ideal, or acts to improve the lot of others, or strikes out against injustice, he sends forth a tiny ripple of hope, and crossing each other from a million different centers of energy and daring those ripples build a current which can sweep down the mightiest walls of oppression and resistance. “If Athens shall appear great to you,” said Pericles, “consider then that her glories were purchased by valiant men, and by men who learned their duty.” That is the source of all greatness in all societies, and it is the key to progress in our time. So too in the life of the honorable and the good it is they who act rightly who win the prize.” I believe that in this generation those with the courage to enter the moral conflict will find themselves with companions in every corner of the world. And moral courage . . .
Is what we need . . . This blog post is primarily to my readers and followers who read my blog on a regular or even a very occasional basis… 🙂 I’ve started a brand new blog titled “Reflections” on WordPress (it’s tied into this blog but has a completely separate URL) and you can find it at this link. This new blog site has a totally revamped look to it’s design to bring it up to the look and feel of a lot of websites publishing today. Also, the theme will be primarily on our “journey” through life since we are all on one, and the posts will be a source of encouragement and hope. If you want to subscribe to the new blog site you can subscribe to it by email or through your WordPress account if you are a blogger on WordPress. You’ll find the subscription info included in the right column and also at the bottom. And, just as a reminder, don’t forget what Jesus taught his followers to do at the beginning of his parable about the persistent widow (see Luke 18:1-8)–and that is to remember to . . .
And never (never, never, never) . . .
Christians around the world celebrated Jesus Christ’s resurrection from the dead last Sunday which we celebrate every year on Easter Sunday. Right now we are in the seven-week period between Easter and Pentecost, a holiday in which we commemorate the coming of the Holy Spirit (see Acts 2) on the early followers of Jesus (source here), which will be celebrated this year on Sunday, May 20th. Jesus remained on the earth for forty days after his resurrection appearing to many people and teaching his disciples before his ascension into heaven (see Acts 1:1-11). Ten days after his ascension the promise that Jesus made to his followers in John 16:7-15 regarding the coming of the Holy Spirit (counselor/advocate) after his death occurred in the filling of the Holy Spirit in the upper room where his followers were assembled (see Acts 2). For a complete timetable of events that occurred between Jesus’ resurrection and the Day of Pentecost, view this list on Spotlight Ministries. The Day of Pentecost is a celebration each year of the coming of the Holy Spirit to indwell believers as Jesus promised in John 16:7-15. “The main sign of Pentecost in the West is the color red. It symbolizes joy and the fire of the Holy Spirit. Priests or ministers, and choirs wear red vestments, and in modern times, the custom has extended to the lay people of the congregation wearing red clothing in celebration as well. Red banners are often hung from walls or ceilings to symbolize the blowing of the “mighty wind” and the free movement of the Spirit” (quote source here.) It is a very festive celebration. Of all the gifts given to mankind by God, there is none greater than the presence of the Holy Spirit. The Spirit has many functions, roles, and activities. First, He does a work in the hearts of all people everywhere. Jesus told the disciples that He would send the Spirit into the world to “convict the world of guilt in regard to sin and righteousness and judgment” (John 16:7-11). Everyone has a “God consciousness,” whether or not they admit it. The Spirit applies the truths of God to minds of men to convince them by fair and sufficient arguments that they are sinners. Responding to that conviction brings men to salvation. Once we are saved and belong to God, the Spirit takes up residence in our hearts forever, sealing us with the confirming, certifying, and assuring pledge of our eternal state as His children. Jesus said He would send the Spirit to us to be our Helper, Comforter, and Guide. “And I will ask the Father, and he will give you another Counselor to be with you forever” (John 14:16). The Greek word translated here “Counselor” means “one who is called alongside” and has the idea of someone who encourages and exhorts. The Holy Spirit takes up permanent residence in the hearts of believers (Romans 8:9; 1 Corinthians 6:19-20, 12:13). Jesus gave the Spirit as a “compensation” for His absence, to perform the functions toward us which He would have done if He had remained personally with us. Among those functions is that of revealer of truth. The Spirit’s presence within us enables us to understand and interpret God’s Word. Jesus told His disciples that “when He, the Spirit of Truth, comes, He will guide you into all truth” (John 16:13). He reveals to our minds the whole counsel of God as it relates to worship, doctrine, and Christian living. He is the ultimate guide, going before, leading the way, removing obstructions, opening the understanding, and making all things plain and clear. He leads in the way we should go in all spiritual things. Without such a guide, we would be apt to fall into error. A crucial part of the truth He reveals is that Jesus is who He said He is (John 15:26; 1 Corinthians 12:3). The Spirit convinces us of Christ’s deity and incarnation, His being the Messiah, His suffering and death, His resurrection and ascension, His exaltation at the right hand of God, and His role as the judge of all. He gives glory to Christ in all things (John 16:14). Another one of the Holy Spirit’s roles is that of gift-giver. First Corinthians 12 describes the spiritual gifts given to believers in order that we may function as the body of Christ on earth. All these gifts, both great and small, are given by the Spirit so that we may be His ambassadors to the world, showing forth His grace and glorifying Him. The Spirit also functions as fruit-producer in our lives. When He indwells us, He begins the work of harvesting His fruit in our lives—love, joy, peace, patience, kindness, goodness, faithfulness, gentleness and self-control (Galatians 5:22-23). These are not works of our flesh, which is incapable of producing such fruit, but they are products of the Spirit’s presence in our lives. With Jesus, it’s easy to be complicated and hard to be simple. Part of the difficulty is that Jesus was and is much, much more than people imagine. Not just people in general, but practicing Christians, the churches themselves. Faced with the gospels–the four early books that give us most of our information about him–most modern Christians are in the same position I am in when I sit down in front of my computer. My computer will, I am reliably informed, do a large number of complex tasks. I only use it, however, for three things: writing, email, and occasional Internet searches. If my computer were a person, it would feel frustrated and grossly undervalued, its full potential nowhere near realized. We are, I believe, in that position today when we read the stories of Jesus in the gospels. We in the churches use these stories for various obvious things: little moralizing sermons on how to behave in the coming week, aids to prayer and meditation, extra padding for a theological picture largely constructed from elsewhere. The gospels, like my computer, have every right to feel frustrated. Their full potential remains unrealized. Worse, Jesus himself has every right to feel frustrated. Many Christians, hearing of someone doing “historical research” on Jesus, begin to worry that what will emerge is a smaller, less significant Jesus than they had hoped for find. Plenty of books offer just that: a cut-down-to-size Jesus, Jesus as a great moral teacher or religious leader, a great man but nothing more. Christians now routinely recognize this reductionism and resist it. But I have increasingly come to believe that we should be worried for the quite opposite reason. Jesus–the Jesus we might discover if we really looked!–is larger, more disturbing, more urgent than we–than the church!–had ever imagined. We have successfully managed to hide behind other questions (admittedly important ones) and to avoid the huge, world-shaking challenge of Jesus’ central claim and achievement. It is we, the churches, who have been the real reductionists. We have reduced the kingdom of God to private piety, the victory of the cross to comfort for the conscience, and Easter itself to a happy, escapist ending after a sad, dark tale. Piety, conscience, and ultimate happiness are important, but not nearly as important as Jesus himself. You see, the reason Jesus wasn’t the sort of king people had wanted in his own day is–to anticipate our conclusion,–that he was the true king, but they had become used to the ordinary, shabby, second-rate sort. They were looking for a builder to construct the home they thought they wanted, but he was the architect, coming with a new plan that would give them everything they needed; but within quite a new framework. They were looking for a singer to sing the song they had been humming for a long time, but he was the composer, bringing them a new song to which the old songs they knew would form, at best, the background music. He was the king, all right, but he had come to redefine kingship itself around his own work, his own mission, his own fate. It is time, I believe, to recognize not only who Jesus was in his own day, despite his contemporaries’ failures to recognize him, but also who he is, and will be, for our own. “He came to what was his own,” wrote one of his greatest earlier followers, “and his own people did not accept him” (John 1:11). That puzzle continues. Perhaps, indeed, it has been the same in our own day. Perhaps even “his own people”–this time not the Jewish people of the first century, but the would-be Christian people of the Western world–have not been ready to recognize Jesus himself. We want a “religious” leader, not a king! We want someone to save our souls, not rule our world! Or, if we want a king, someone to take charge of our world, what we want is someone to implement the policies we already embrace, just as Jesus’s contemporaries did. But if Christians don’t get Jesus right, what chance is there that other people will bother much with him? Want to know more? Get the book! Here’s a link to the Amazon.com page. I’ll end this post with Jesus’ words found in John 8:32 . . .
Then you will know the truth . . .
Will set you free . . . .
Jesus is risen . . . He is risen indeed . . .
What will you do with him . . . .